Directed by Paul Thomas Anderson and shown as part a two film tribute to him, over the next fortnight. The intersecting life stories of Daniel Plainview and Eli Sunday in early twentieth century California presents miner-turned-oilman Daniel Plainview, a driven man who will do whatever it takes to achieve his goals. He works hard but also takes advantage of those around him at their expense if need be. His business partner/son (H.W.) is, in reality, an “acquired” child whose true biological single-parent father (working on one of Daniel’s rigs) died in a workplace accident. Daniel is deeply protective of H.W. if only for what H.W. brings to the partnership. Eli Sunday is one in a pair of twins whose family farm Daniel purchases for the major oil deposit located on it. Eli, a local preacher and a self-proclaimed faith healer, wants the money from the sale of the property to finance his own church. 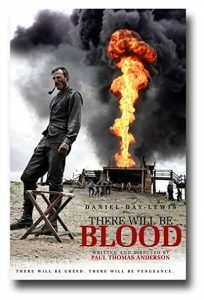 The lives of the two competitive men often clash as Daniel pumps oil off the property and tries to acquire all the surrounding land at bargain prices to be able to build a pipeline.